This year we ate all winter from the broccoli and greens growing under frost blankets. 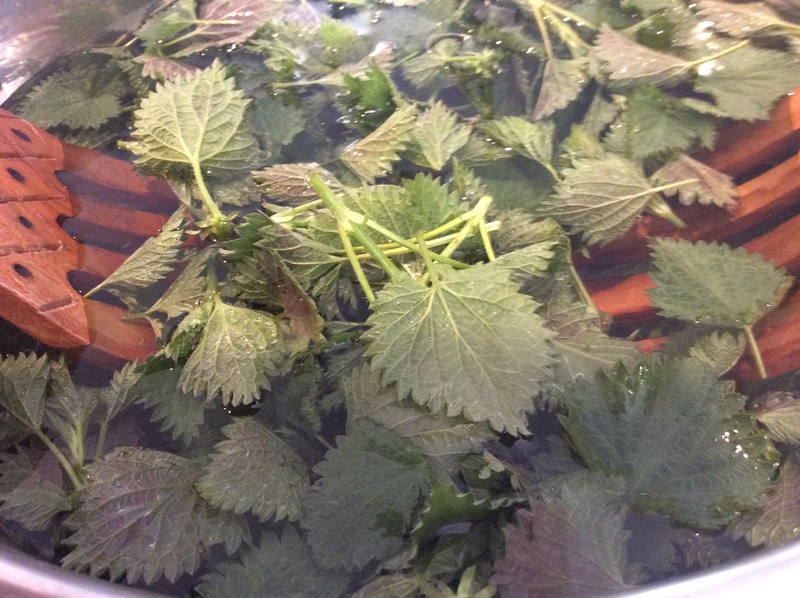 Even so, it remains a major spring event when the first nettles are ready to pick. They taste so good and give such an all-over glow of virtue. There are people who think that nettles have special medicinal benefits. My own belief is that all dark leafy greens have medicinal benefits, and the important thing is to eat as wide a variety of them as possible. But that first meal from the uncovered soil does confer a special feeling that spring is finally and truly here. 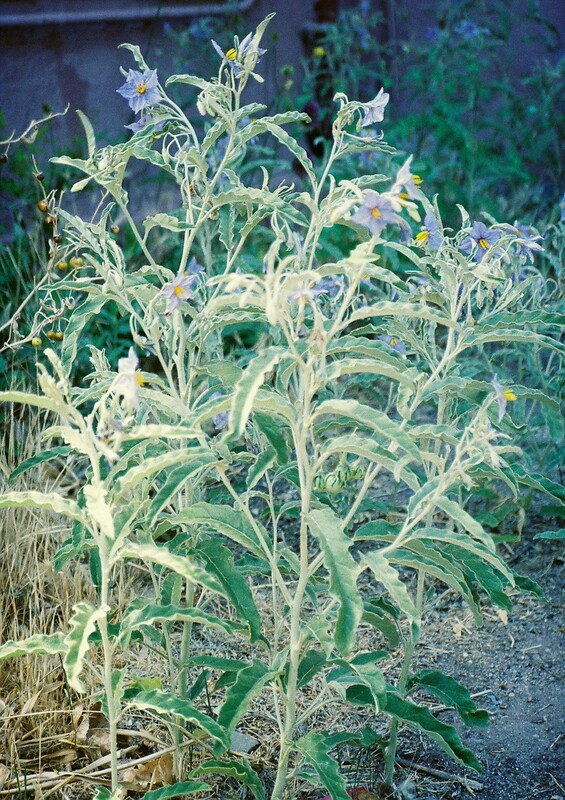 If you aren’t familiar with them, consult a good wild-food field guide, and be aware that the sting is quite uncomfortable and can last hours. Have leather gloves handy for picking. They’re ready to harvest when 6-8” tall. 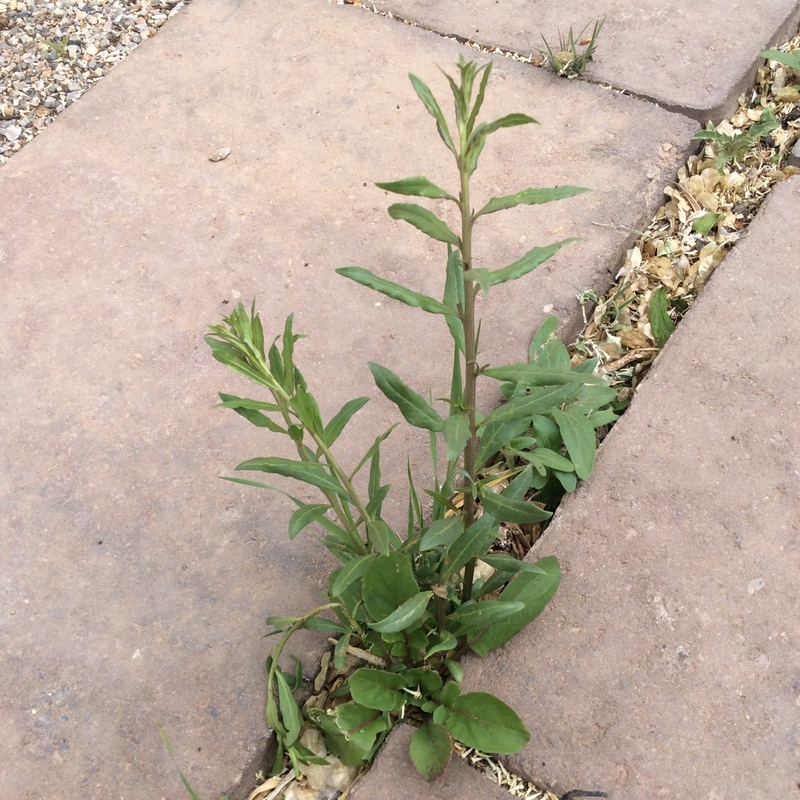 I cut off the top 2” or so, including as much leaf and as little stem as possible. I turn them into a big bowl of water and stir gently with a wooden spoon for 2-3 minutes to get dirt off. My favorite tool for lifting them out of the water, leaving any dirt that was present at the bottom of the bowl, is a pair of “salad hands” that somebody once gave me as a hostess gift. A large slotted spoon would work too. I make sure to throw the water on a garden bed. We live in the desert, after all. 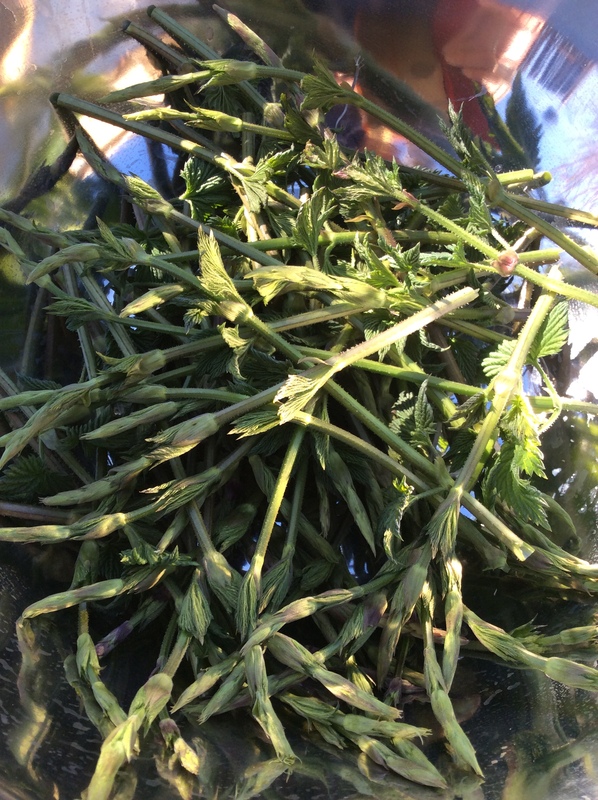 Cooking nettles is a breeze, but in my opinion chopping is a necessary step, to eliminate stringy stems. First I put them in the pan with about half a cup of water, and cook over high heat, stirring, for about two minutes or until thoroughly wilted. The water should be pretty much gone. Turn out on a cutting board, let cool for five minutes or so, and chop. The cooking has eliminated their capacity to sting, and you can handle them with impunity now. 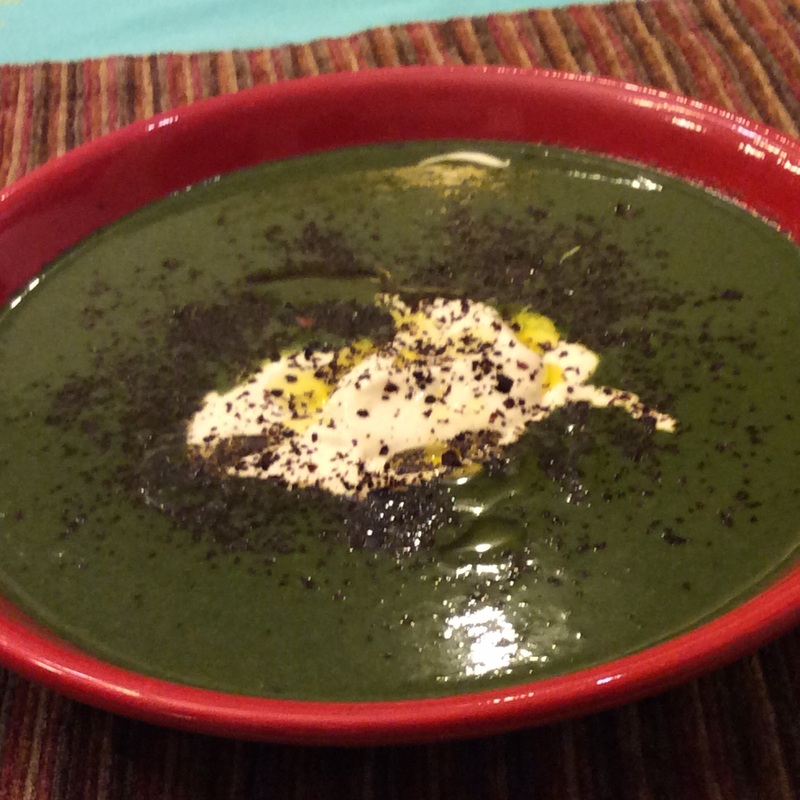 The flavor of nettles is rather like spinach, but deeper and richer, with a slight feral twist. I especially like them creamed, and always eat the first ones this way. 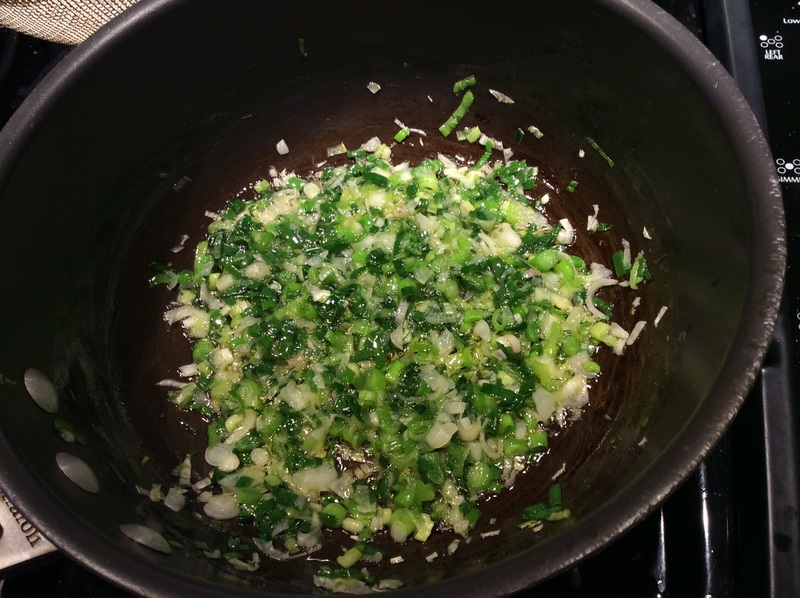 Slice up two big fat green onions, sauté them in butter until cooked, add chopped nettles, sauté another minute or so, add heavy cream just to cover, boil for a couple of minutes until the cream is thickened, and salt to taste. 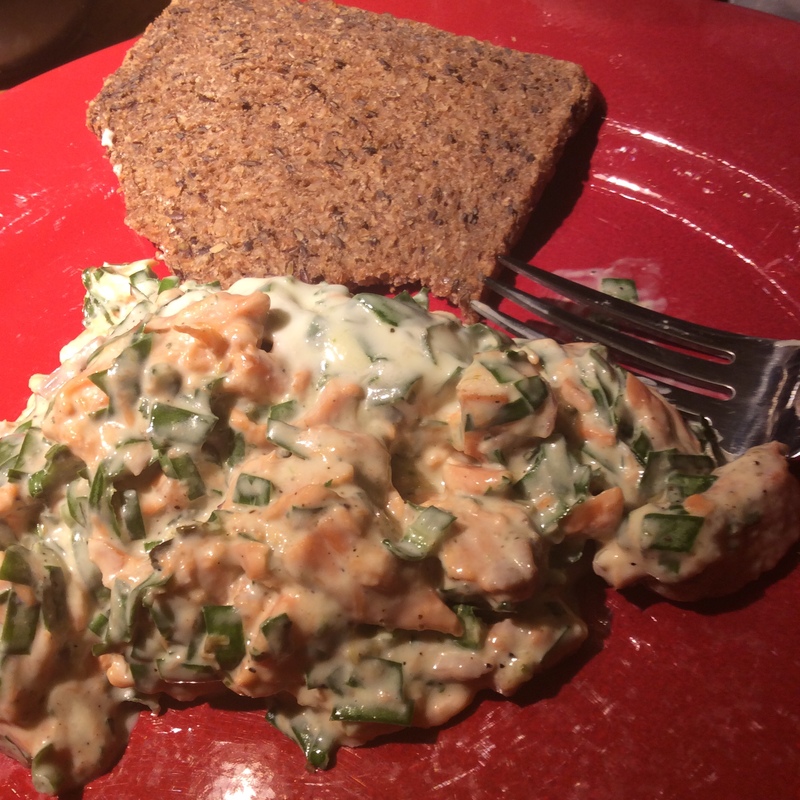 Serve with freshly ground pepper and nothing else, so that you can taste the true flavor of the nettles. 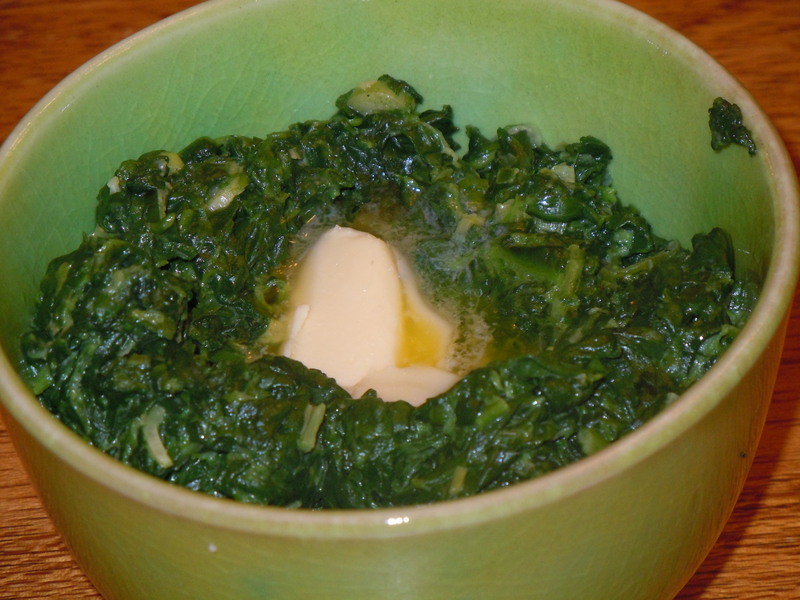 You can also use netales in absolutely any way that you would use cooked spinach. They are infinitely versatile, and I have never served them to anyone who disliked them. After the initial cooking and chopping, they can be frozen for later years. 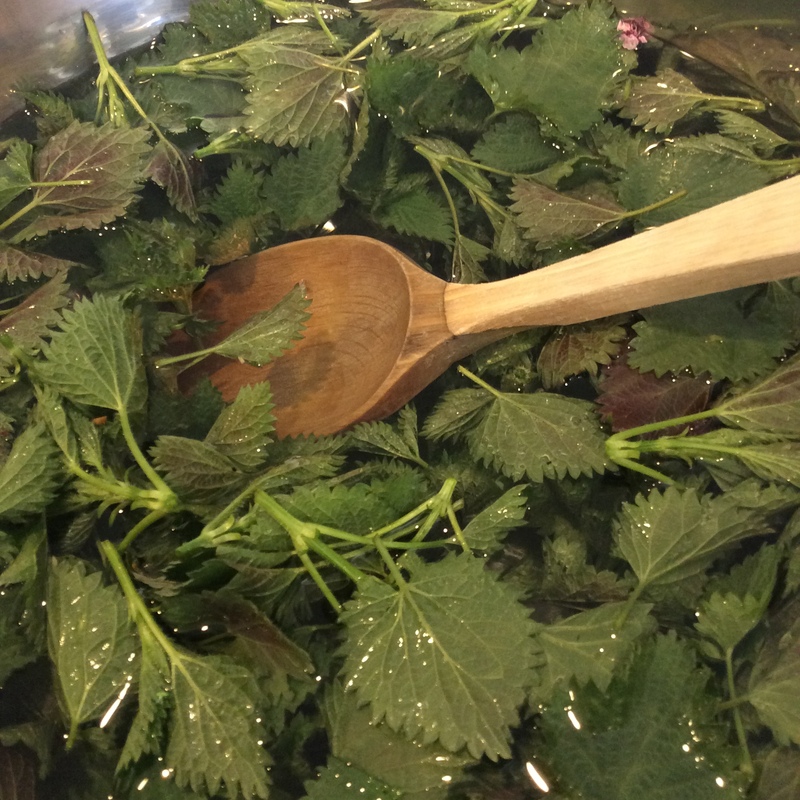 Whenever I wash and cook nettles, I try to make about twice as much as I need for immediate use, so that I can freeze the other half. They can be dried for tea, although I do not care for the watery tasting tea that results and don’t bother. Adding a twist of orange peel or something similar would give more flavor. I am not much of a tea drinker, but if you are, this might be worth considering. 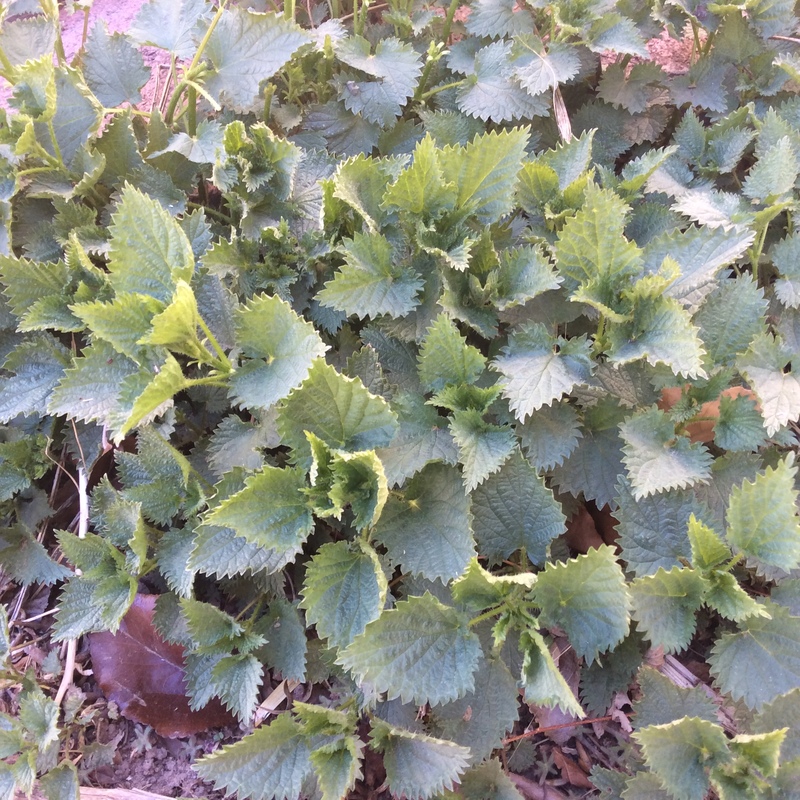 If, like me, you live in an area who are nettles don’t grow naturally, there are some considerations to growing them in your yard. First is obtaining them. 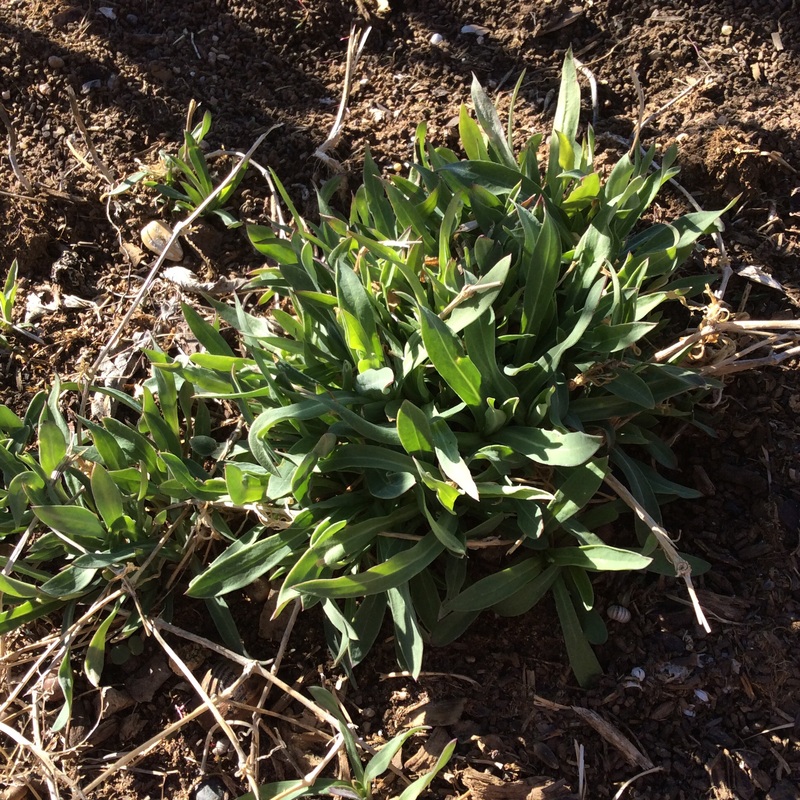 When I first started growing them in central New Mexico about 12 years ago, I could not get seeds to germinate and no herb nurseries offered them. I finally called an herb nursery from whom I was buying other things and asked if they could please find me some nettles. The “plants” I received had clearly just been dug from the nearest roadside, and were little more than cut rhizomes in potting soil, but they grew just fine. These days they are easier to find and a number of mail order nurseries have them. Siting must be done carefully, because of the sting and because they are invasive. I have mine in an area surrounded by concrete, where they cannot escape to parts of the yard where I don’t want them. My large dogs are readily able to avoid them, but I have heard that they could do real harm to very small dogs, so keep this in mind. Growing them in areas where small children could get into them is an obvious no-no. They get tall and gangly and flop around, but if cut or mown back in summer, they stay neater and make a second crop in fall. I hope that I am never without nettles in spring. If green garlic is always the first thing that I harvest in spring, nettles are always the second. 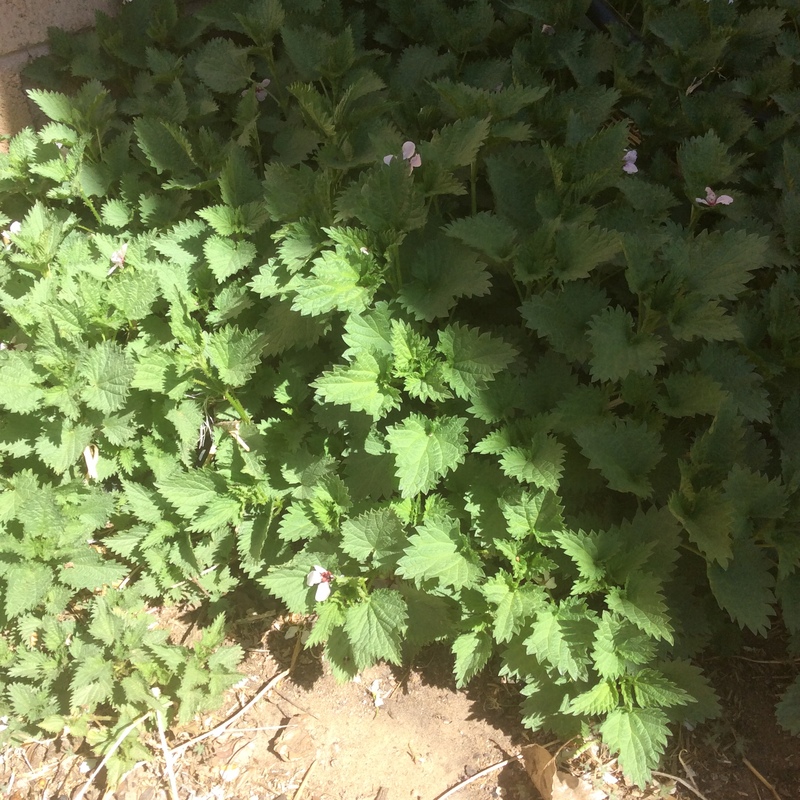 When I moved to New Mexico I couldn’t find any and couldn’t get seeds to germinate, so I was reduced to calling an herb nursery and begging them to dig up some nettles on their property and sell them to me. Every spring I’m glad that I did. Gather the tender tops with as little stem as possible, wearing leather garden gloves. Don’t handle them without gloves, no matter what you read on the Internet. I always manage to pick up a sting on my wrist just above the glove, but it hasn’t killed me yet. Wash in a big bowl of water, stirring them with a wooden spoon. Drain and dump them into lightly salted boiling water. Boil for two minutes and drain. 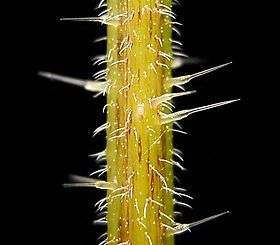 They are now rendered weaponless: the venom (formic acid) has been denatured by heat and the zillions of fine spines that do such a good job of injecting the venom into your skin are soft. Squeeze the drained greens dry, chop them up to eliminate any stringiness in the stems, and finish cooking them any way you like. They are awfully good just braised in cream with a bit of sautéed green garlic and finished with butter and a little salt. You can click on the “greens” category of this blog for some other ideas. They are a mild-flavored green and can be used any way that you use spinach, although the flavor is a little different; “wilder” is the best way I can describe it. They are ultra-nutritious and worthy of a place on your spring menu. 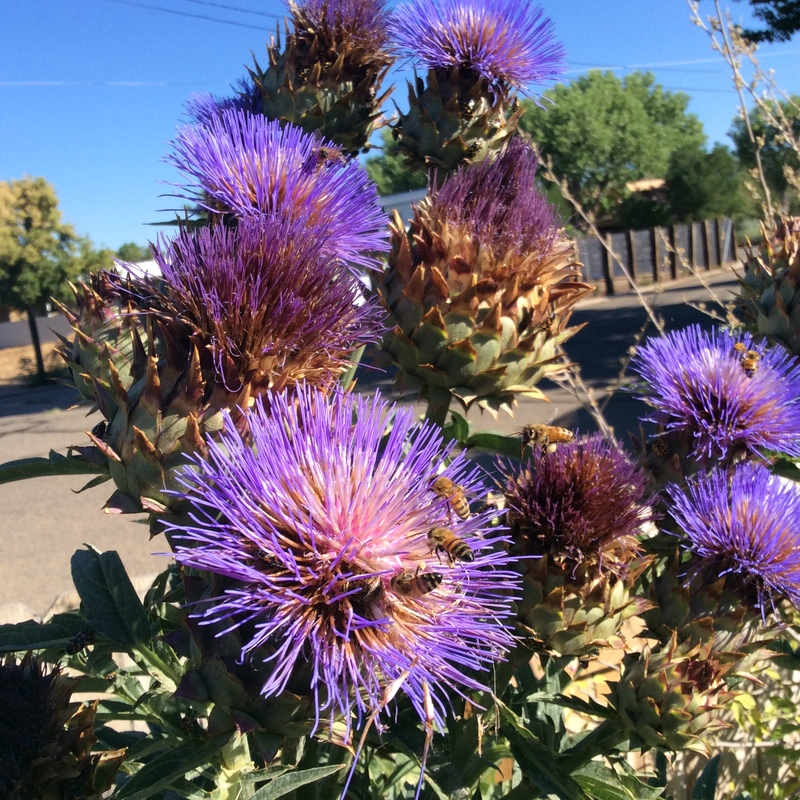 They are even…gulp…worth buying plants of if you don’t have them naturally. Every now and then I encounter some committed permaculturist who earnestly wishes to educate me about planning guilds (functional plant groups) in my garden. I just don’t think this way. 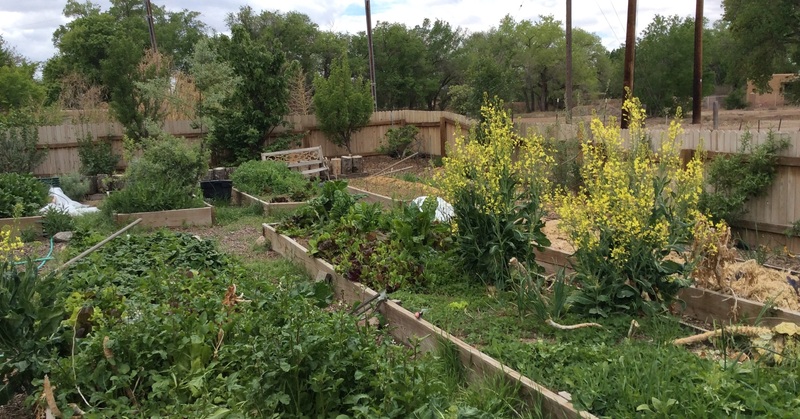 It seems to me that, if you love to grow food, have a fairly high chaos tolerance, and live somwhere long enough, you will naturally and accidentally discover what thrives in groups in your area, as well as what you really like to eat. Take the large pot above, which has been next to my back patio for four years. It is a microcosm, or micro-cosmos, of my interests over the time since it was placed. In it you can spot the gorgeous leaf lettuce Merlot that I’m growing this year, chickweed that I planted three years ago and which is self-seeding nicely, moringa that I started experimenting with last year (which, incidentally, wintered over in a pot that isn’t watered in the winter and survived a very cold winter,) Shirley poppies from four years ago when this pot was placed, and wild lettuce which seeds itself all over at my house and which I tolerate because I like it in cooked greens. My planned combinations haven’t come out nearly so well. 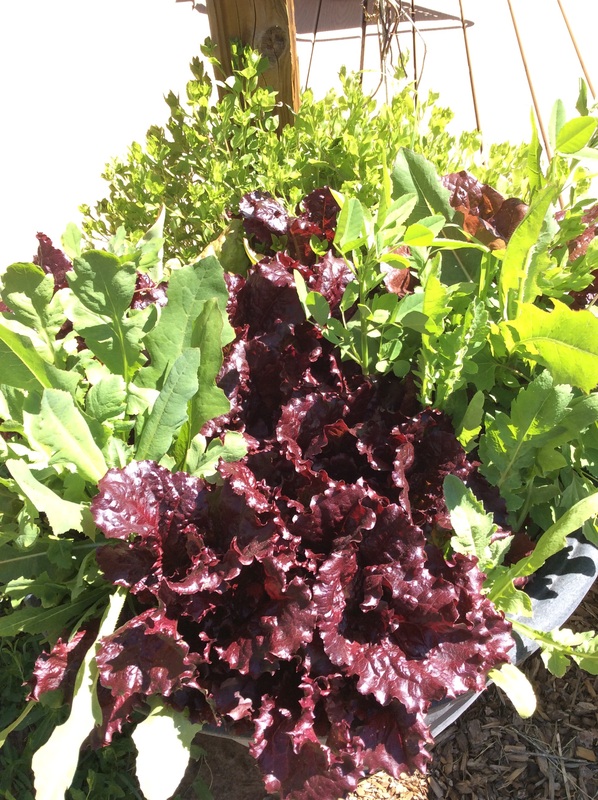 Everything in this pot is edible; yes, even Shirley poppy leaves are fine in cooked greens. But it all happened through planting things, not weeding too assiduously, and seeing what happened. If you have a poor memory and are prone to planting things in spots where you already planted something else and then forgot about it, some further felicitous combinations will occur. A linden planted for its edible leaves has a bird-sown wax current bush growing in its shade, bearing more heavily than its siblings in full sun. Bladder campion seeds itself into the shady north corner under the linden. Siberian elms, self-sown all over, can be coppiced for free goat feed. A bird-sown mulberry nearby can be coppiced for tender edible green shoots to use in cooked greens. 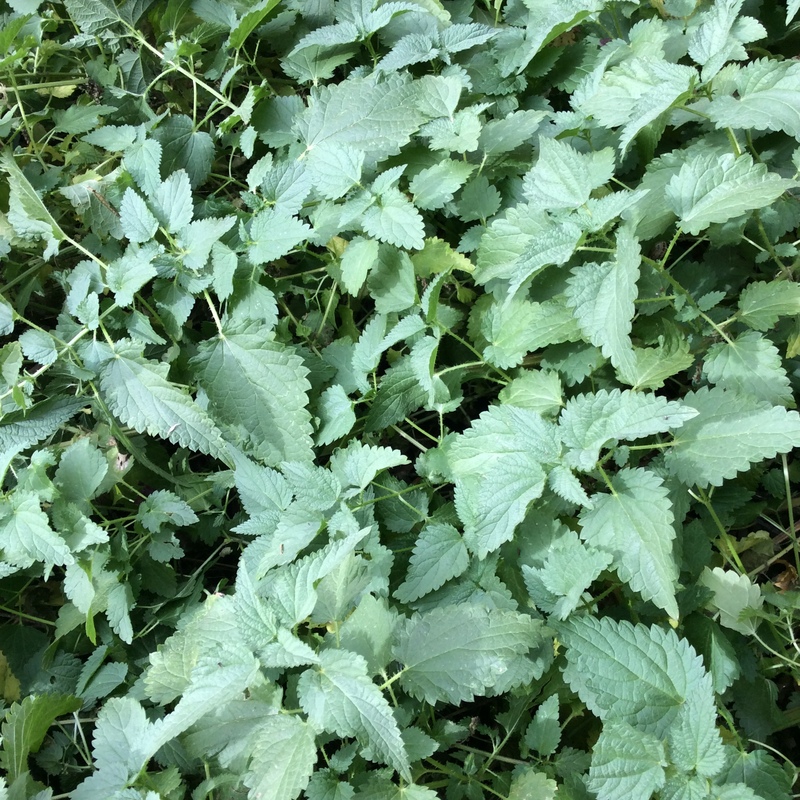 Stinging nettles, struggling in the baking desert sun, root their way into the shade of the elm and mulberry coppices and begin to flourish. Stems of oyster mushrooms, dug into garden beds in the fall, produce a few nice oyster mushrooms in the shade of lettuce the following year. 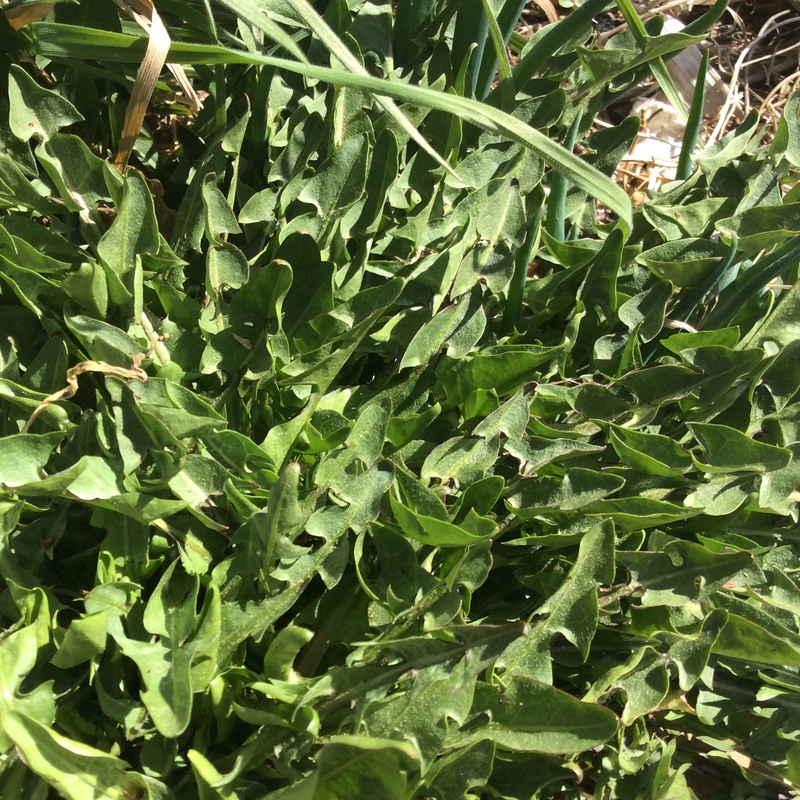 A single lambs-quarters is allowed to seed, and late-spring crops of mild and nutritious greens show up all around your intentional plantings for years. 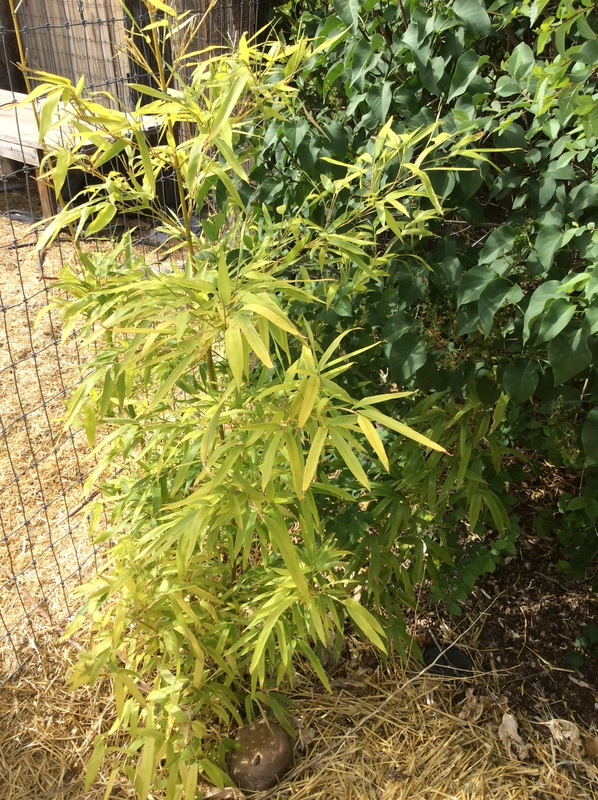 A Russian olive that grows smack in the middle of a garden bed despite years of cutting it back and cursing it, can be pruned into a support for climbing snow peas. A really poor clump of garlic at the base of a tree, left by the last owner, turns out to be indestructible through baking summers and perfect for green garlic. Scorzonera and wolfberries make some good food out of baking unimproved spots where you can’t get anything else to grow. A local non-edible legume, the desert bird-of-paradise, springs up and offers light shade to the wolfberry, giving it a new lease on life and more tender leaves that you can toss into greens mixtures. 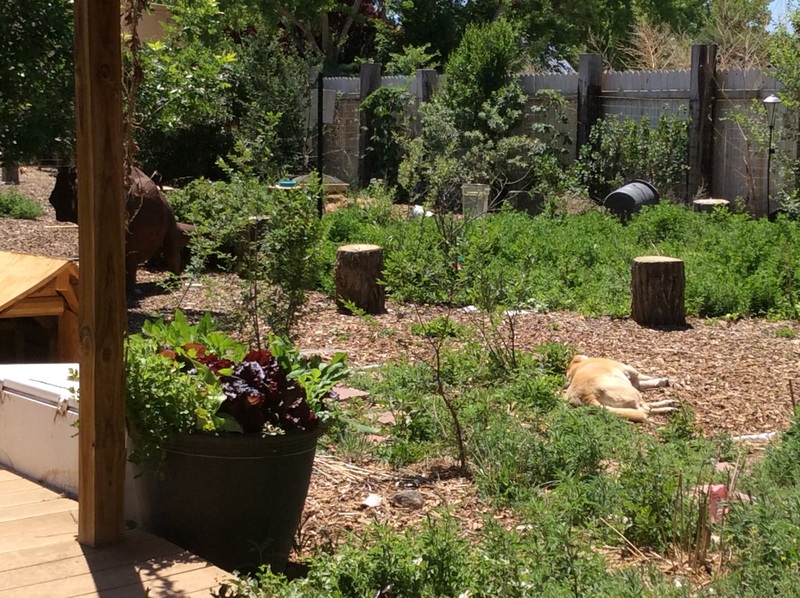 None of this is especially tidy, and the straight-row sort of gardener would never tolerate it. But for those of us who love a bit of natural mess and take our vegetables and our epiphanies where we can find them, it works. There is nothing more vibrant than a garden full of greens in the spring, all growing like mad, offering you a million healthy possibilities. During the two unfortunate years that I couldn’t garden, I did at least rogue out all the weeds that weren’t edible, and now nearly everything that sprouts in my beds is delicious, whether I planted them intentionally or not. And everybody, every one of us, would do well to eat more greens. Our health would improve and we would feel so damn good. Remember, the REAL Mediterranean diet, the one that was originally studied on Crete and that produced a long-lived and healthy population, was based on a huge variety of cultivated and wild greens. Today I noticed nettles, spinach, and lambs-quarters that needed to be harvested pronto. I also had lively green garlic ready to harvest. I picked a three-gallon pail to the brim, but loosely filled as I threw the bounty in, not packed down. 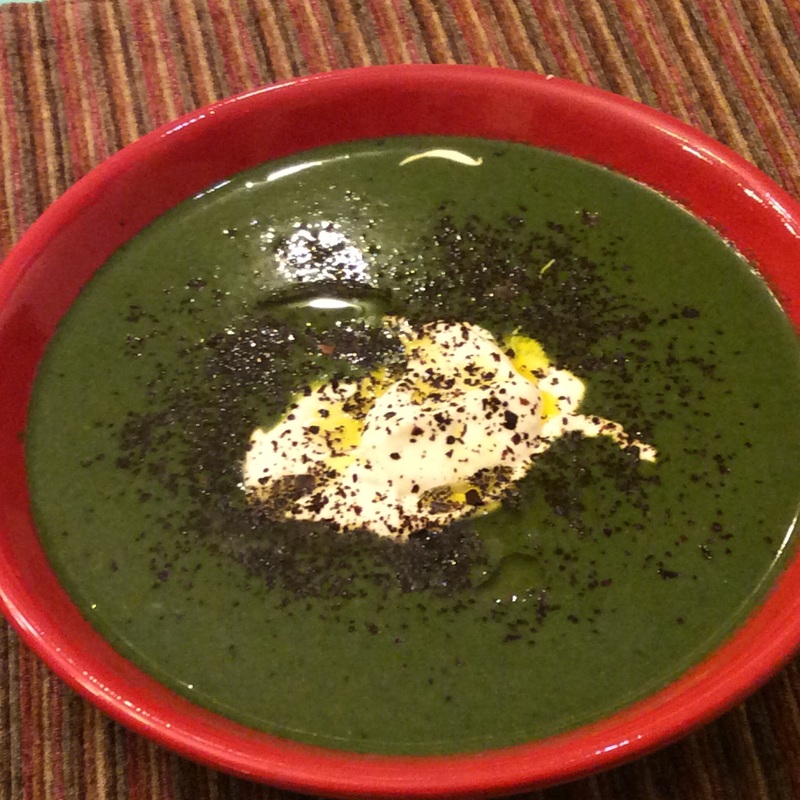 I washed them ( it goes without saying that when nettles are in the mixture, you use gloves whenever handling them and stir in the washing water with a big wooden spoon, not your hand,) and decided to make a Turkish greens soup for dinner. 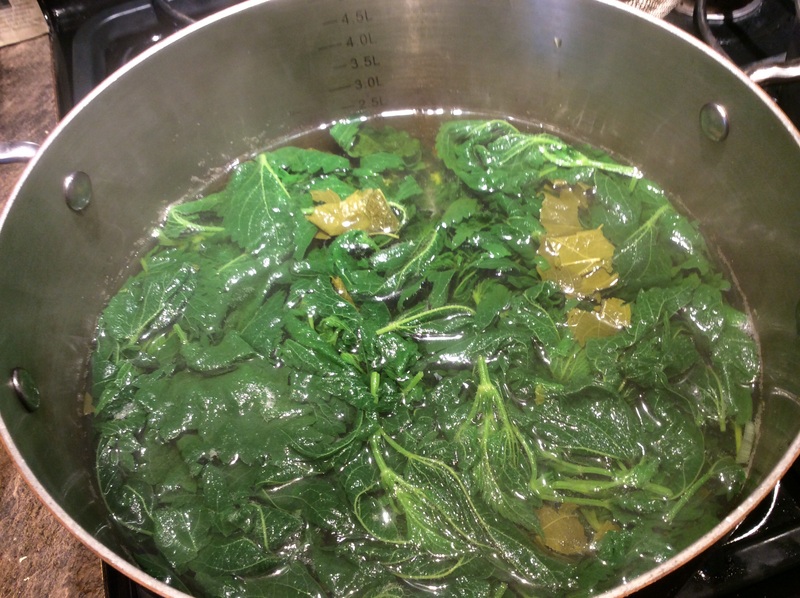 Prepare and wash three gallons, loosely packed, of assorted greens. No bland store-bought baby spinach! 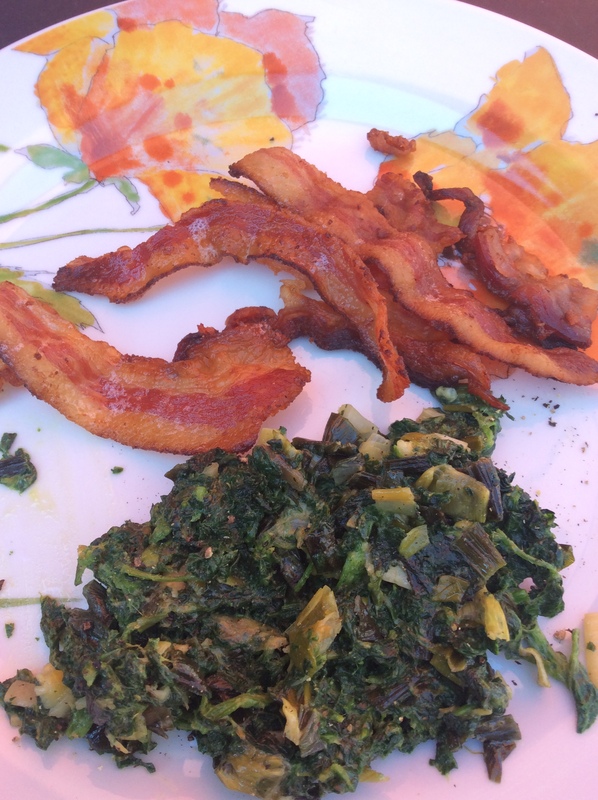 If you don’t have a garden, consider chard, adult spinach, and Tuscan kale, one bunch each. Pull a quart of good rich chicken stock out of the freezer (it is in there, isn’t it? )or procure a quart of good chicken stock from somewhere. Set the chicken stock to melting over medium heat in a gallon pot. Chop three large stalks of green garlic, stems, leaves, and all, and sauté them in a quarter cup or so of excellent olive oil in a sauté pan. OR use a small onion and two cloves of garlic, chopped, for the sauté step. Make sure they are cooked through, and soft but not colored, before proceeding. 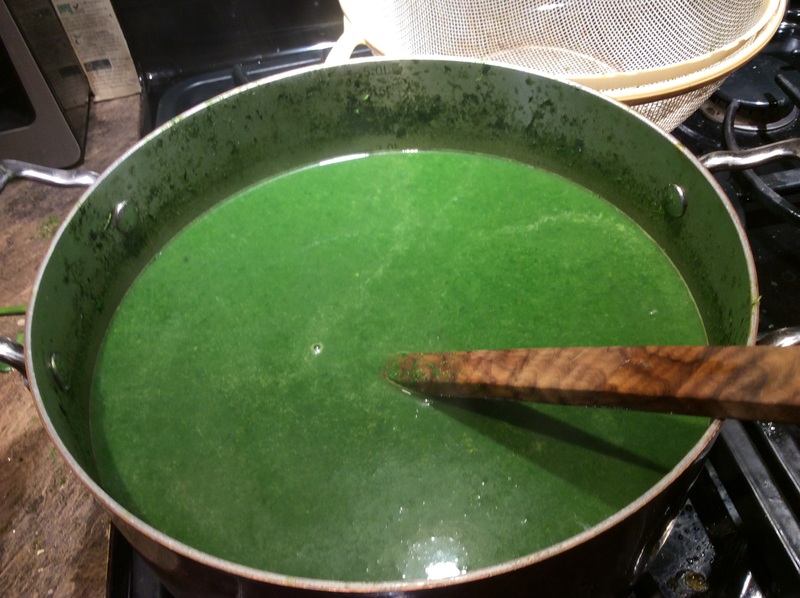 When the garlic mixture is ready and the stock is boiling, begin adding the greens to the stock, stirring, and remembering not to touch those nettles. Boil for about a minute after the last of the greens is added. Now add the garlic mixture to the soup pot and simmer for five minutes. Now purée with a stick blender. Add salt to taste (I think it needs to be on the salty side)and add a teaspoon of Urfa pepper flakes, Aleppo pepper flakes, or mild red pepper flakes. I like a bit of oregano and thyme. Taste and correct the seasoning carefully. Mix some full-fat Greek yogurt with salt to taste and have it ready. Put six egg yolks in a bowl, whisk them up, and slowly add a cup of the hot soup, whisking furiously all the time. Slowly pour the egg mixture into the soup over lowest heat, and whisk another minute or two until it’s lightly thickened and smooth. Serve into bowls, pile a half cup of salted yogurt in each bowl, drizzle lavishly with your best olive oil, and sprinkle heavily with more Urfa or red pepper flakes. Eat, and flourish. 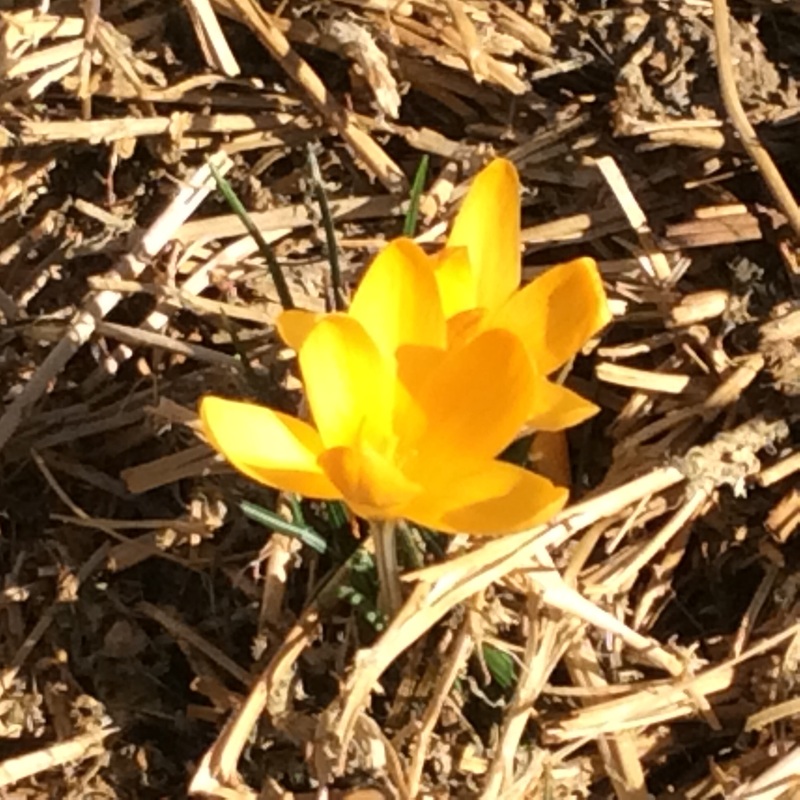 Our recent sunny warm days have brought the happy little Crysanthus crocuses up, and when they bloom I know that I’ve survived another winter and we are well on toward spring. But we are still in the time of year called the “hunger gap,” when in leaner times you would have eaten most of your preserved and stored food and fresh food would be a distant memory. In those days, just about the time that scurvy threatened, there would be a precious few fresh foods that would come through for you. I am no longer that interested in eating preserved foods, so the fresh greens of the hunger gap are increasingly important to me. 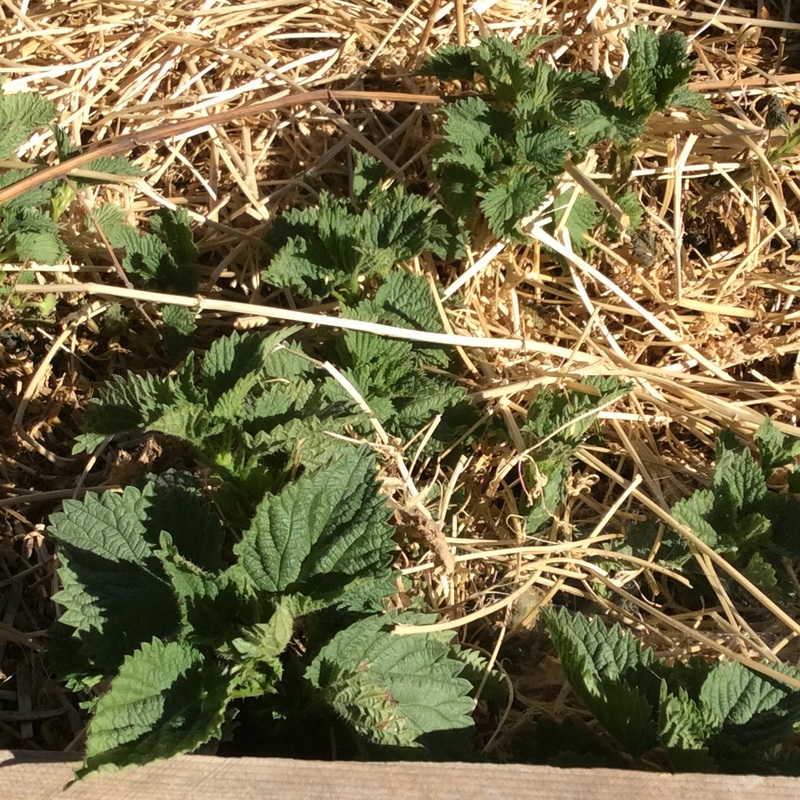 Stinging nettles are not just a fresh green in earliest spring, they are a nutritional powerhouse. Vitality and well-being seem to course through your body as you eat them. Also, they’re delicious. They don’t occur naturally in Albuquerque, and I had to buy plants in order to have them, but I have two nice patches now. 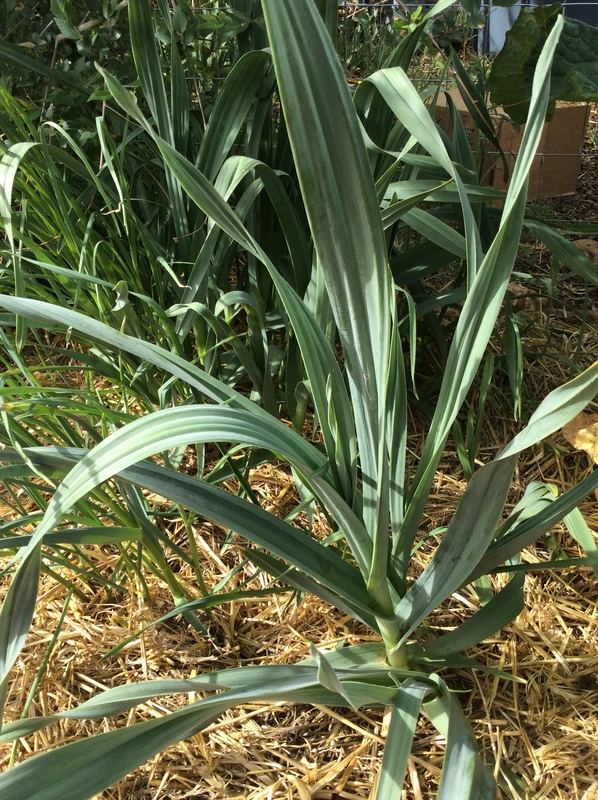 They need some water and mulch in our desert area, but given those they spread rapidly, so be ready to control them by digging out excess roots when they spread too far. They sting fiercely at any age, so don’t plant them near paths and have good heavy leather gloves (they sting right through fabric) ready for harvesting. Pick any time after they reach about 5-6 inches high, harvesting the top 2 or 3 inches. You will have about a month to harvest before they get tough, gritty, and nasty. Keep your gloves on while you wash them and drop them into boiling water. Once blanched for 1-2 minutes, their spines are softened and their venom is broken down, and you can treat them like spinach or any other mild green. I love them in omelets or just blanched and chopped with some butter and cream. 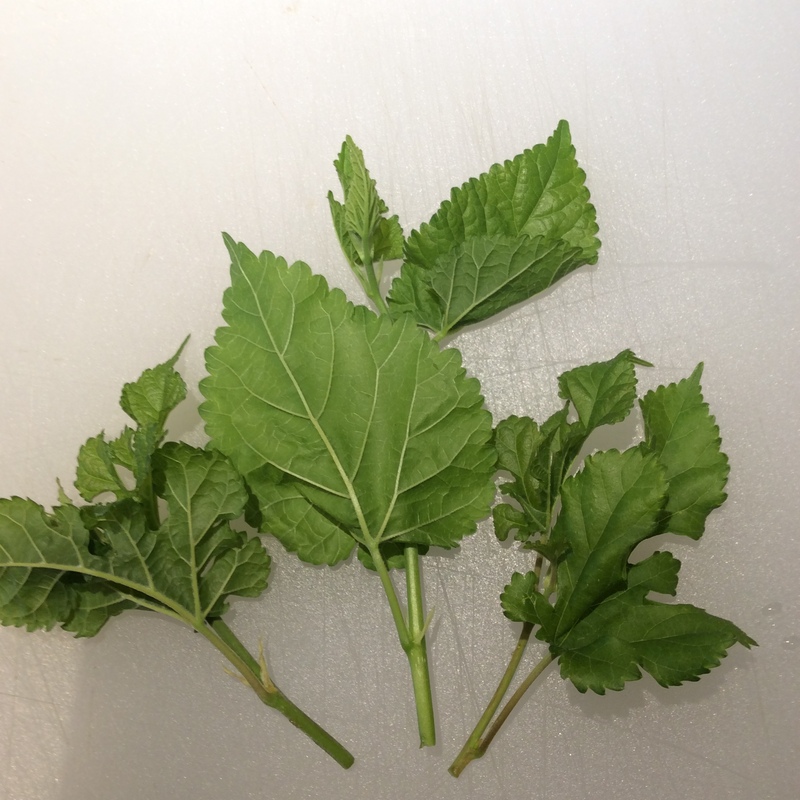 Be aware that the raw nettles can sting animals as well as people, and severe allergic reactions to the sting are possible, so please do site them responsibly. 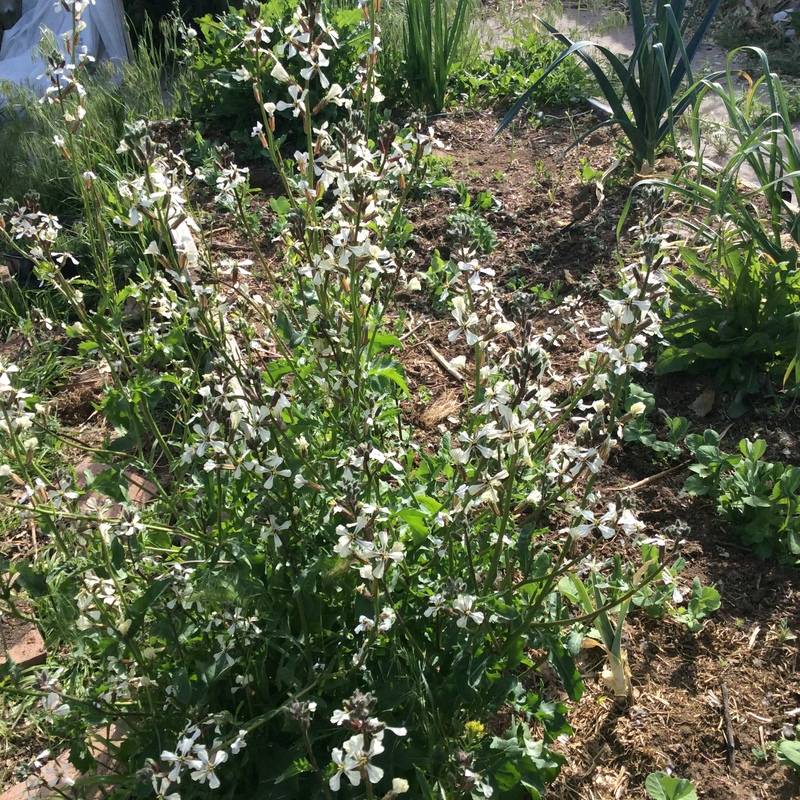 Bladder campion is another weed that doesn’t occur naturally in central New Mexico. I bought seeds from an herb supplier. Sprinkle them in a place that you can keep watered in late winter. In hot sunny areas they will appreciate a little shade. They will be scant and spindly the first year, and there won’t be anything to harvest. 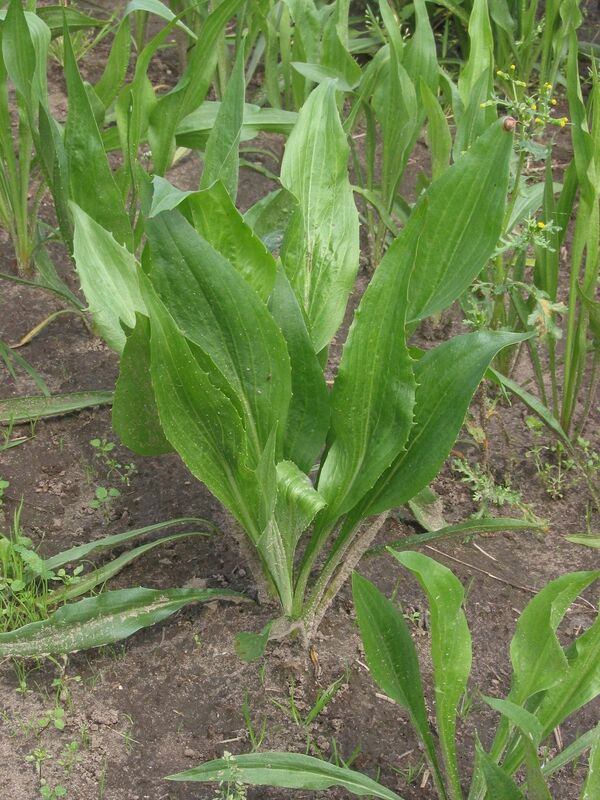 The second year you can pinch off the tips when they are 6-8 inches tall to add to salads, and by the third year you should get enough to cook. They are among the tenderest and mildest of wild greens, and I prefer them in salads, but a quick sauté in a little good butter is nice too. 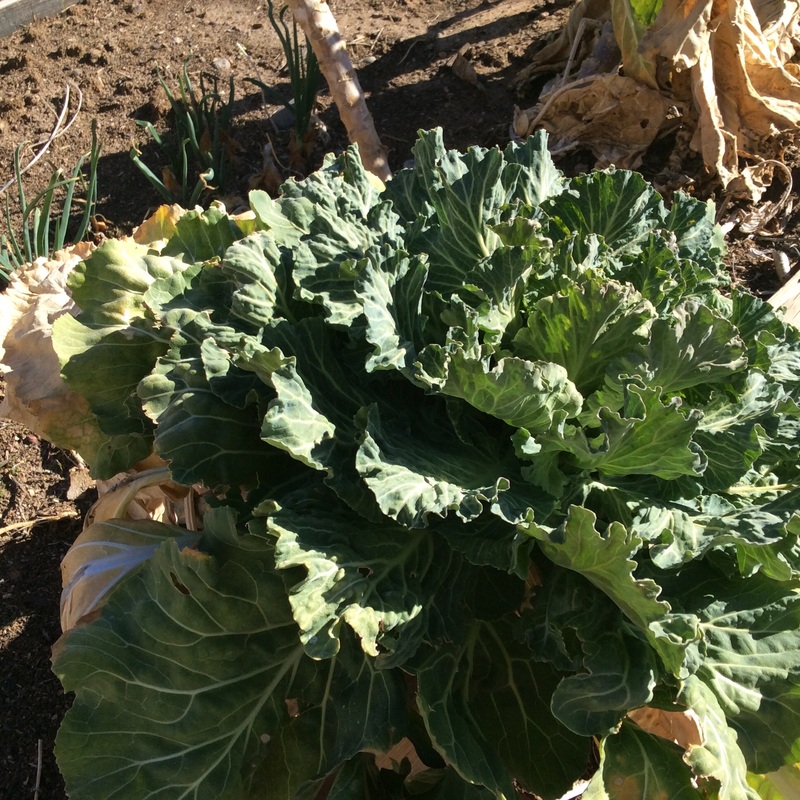 Tronchuda is not a weed, but a Portuguese kale with a cabbagey but mild flavor and enough vitamins, minerals, and antioxidants to make you crow. I bought my seeds from Nichols Garden Nursery a couple of years ago, and am selecting the ones that live through the winter for my Hunger Gap crop. 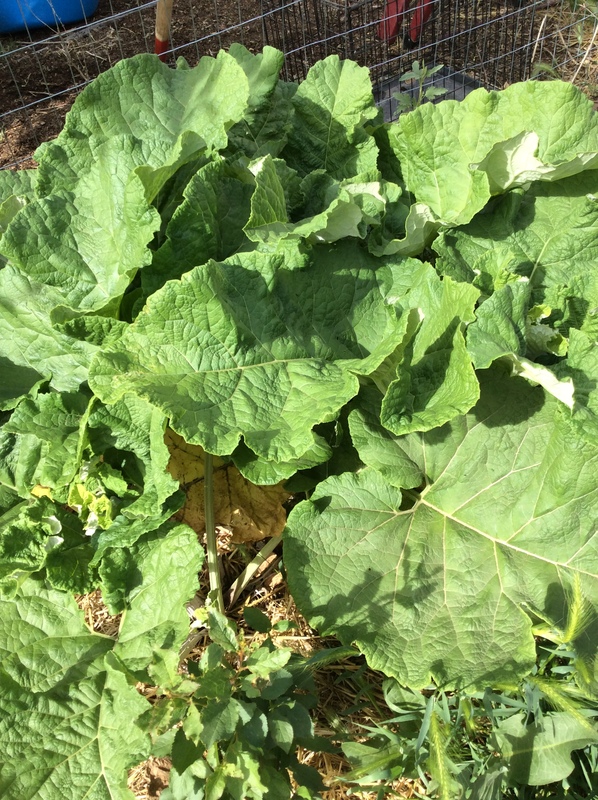 You plant them in the spring, harvest the huge leaves for greens in summer and fall ( my chickens appreciate them too), and then leave the stem and the tuft of leaves at the top over the winter. They won’t survive if you don’t leave some leaves on. Those that survive will begin to leaf out again in February and provide you with thick, substantial leaves for stir-fries and cooking by early March. 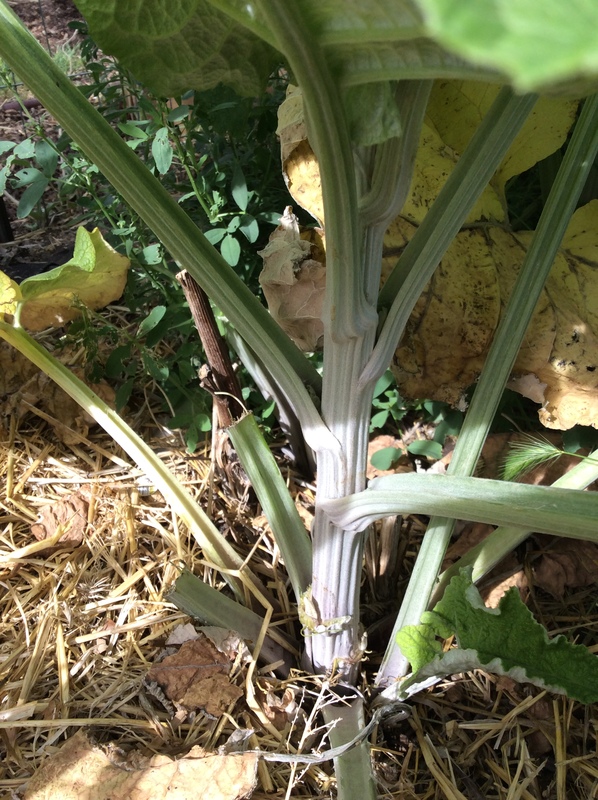 They are biennial and begin to shoot to flower by late March, and you can harvest the buds as a broccoli-like vegetable. Do bear in mind that if you want to save seed, you have to leave plenty of clusters to go to flower. 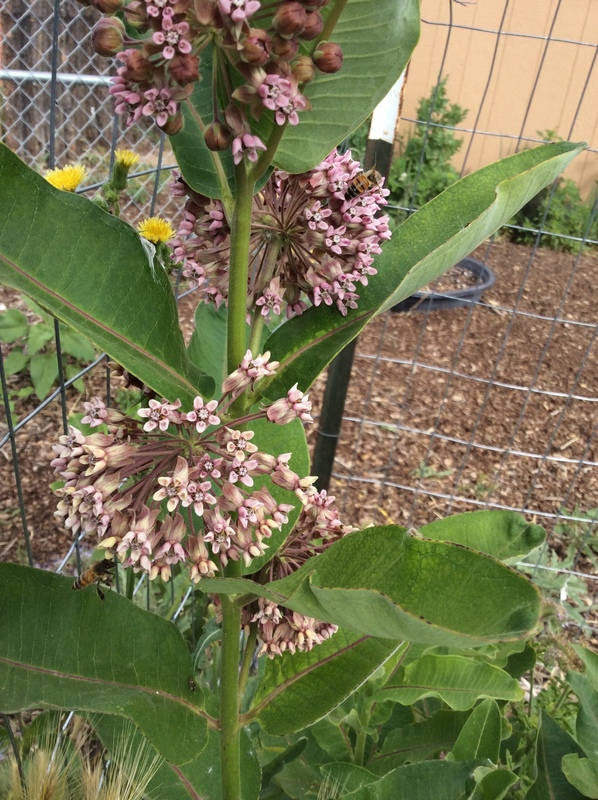 Bees love the flowers and they are a nice early source of nectar. Collect the seed, dry them, and start the cycle over again.